Melbourne's Southbank is the location for a new arts-themed residential project being developed by Crown Group and G3 Project. Developer Crown Group will launch its first Melbourne project this year after receiving planning approval from the City of Melbourne in January. 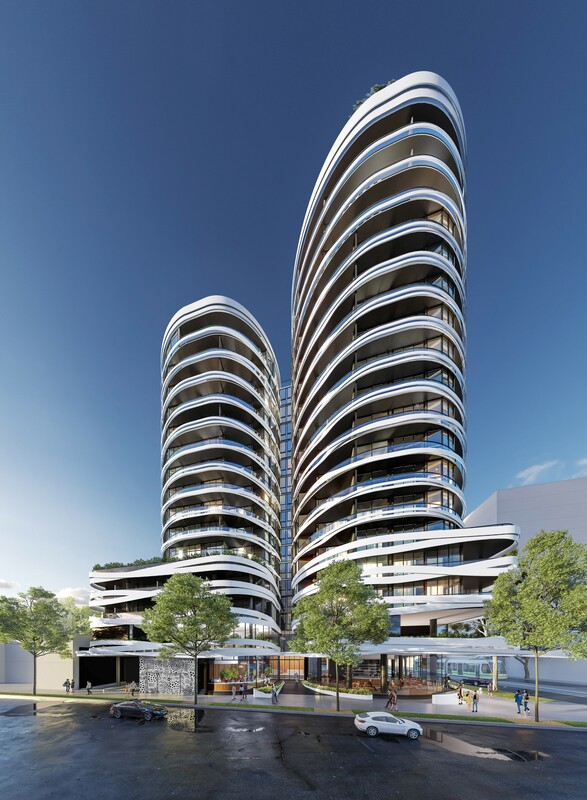 A joint venture with long-time Melbourne developer G3 Project, the new arts-themed Southbank residential project will encompass two towers of 14 and 16 storeys set across a corner site of 2070sqm located at 175 Sturt Street. The two towers will host 152 luxurious studios, one, two and three-bedroom apartments and generous common areas. Designed by world-renowned Koichi Takada Architects, the site is set to include a community arts space in the lower level to host exhibitions and installations, as well as provide a cultural meeting point. Mr Takada said the two striking curved white towers encircled by sinuous white “ribbons” were inspired by images he had seen within the arts. “The ribbons will form a beautiful pattern that will gleam white, reflecting the light, creating an ever-changing canvas and a beacon to people in the surrounding area,” he said. Construction is set to begin in 2021 on the project, which is designed to complement the Victorian Government’s plan to invest more than $200 million over the next two years to reimagine Southbank and the surrounding arts precinct. Residents will have access to Crown Group’s signature resort-style facilities, which include a rooftop lounge and garden, a theatre, children’s play area, gym and indoor pool. There will also be a ground-floor café and parking for 140 cars and 40 bicycles in a four-level podium. Crown Group Chairman and CEO Iwan Sunito said the project was part of Crown Group’s vision to grow a $3 billion development pipeline in Melbourne. “This is the part of our think big, start small strategy,” he said. “Our bigger plan is to grow our pipeline in Melbourne, but we wanted to start with a single project first to test the market. “Melbournians are very passionate about arts and culture, it is one of the most cultural cities in the world, so we thought, why not create something that tells to that story. “We chose this site out of the many options that were available to Crown Group because it is strategically located in the arts precinct and close to St Kilda Road, with unblocked views to the city, and you can walk to all the galleries and theatres."